2016 has already proven to be the year in which the rules of previous election years were discarded. 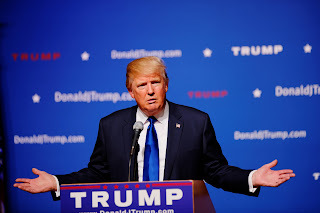 The putative outsider Donald Trump leads the delegate race for the Republican presidential nomination in spite of the fact that he isn’t a conservative, supports unconservative policies such as universal healthcare and breaks all the rules of decorum and civility associated with politics. From the left, Bernie Sanders, an avowed democratic socialist, has challenged the Clinton political machine for the Democratic nomination. From the center left, former New York mayor Michael Bloomberg has hinted at a possible run for president under a third party banner. Mainstream Republicans are calling for a third candidate to oppose Trump if he wins the nomination. In a normal year, a third party would do little more than siphon votes from one of the two major parties, but, in a year when all the rules are being broken, could a third party candidate win? For now, Bloomberg has backed away from a presidential run, but may change if Hillary Clinton is indicted or loses the nomination to Bernie Sanders. Many Democrats like Sanders, but feel that an out-of-the-closet socialist is not electable. Hillary Clinton, although liked by few and trusted by fewer, is looked upon as the safe bet for Democrats. Nevertheless, if Clinton wins the nomination and is then indicted by the FBI or otherwise implodes, Bloomberg might run to give liberals and moderates a viable option. There is a different scenario under which a third party candidate could actually become president. This scenario involves Donald Trump winning the Republican nomination. A significant portion of Republicans are rallying around the #NeverTrump Twitter hashtag and pledging to vote for the Democratic nominee or simply stay home if Mr. Trump wins the Republican nomination. Under the second scenario, a third (or fourth) party conservative candidate would challenge Donald Trump from the right on behalf of aggrieved conservative voters who dislike Mr. Trump’s political positions and personality and who worry that his candidacy would damage the Republican brand for a generation. In February, Sen. Ben Sasse (R-Neb.) became the first Republican to declare that he could not support Trump and called for a third option if Trump won the nomination. Under this scenario, the third party candidate would not have to win the election outright. The strategy would be to deny both Hillary Clinton and Donald Trump an Electoral College majority. This could be accomplished by picking off strategic states from both the blue and red columns. For example, a conservative third candidate might win Texas where Ted Cruz bested Trump in the primary. Ohio, where John Kasich beat Trump might also be a possibility. Given the weakness and unpopularity of Hillary Clinton, some blue collar Democrat states might also go third party. Pennsylvania, Iowa, the Rust Belt state of Wisconsin would be possibilities. Under the Constitution, if no candidate receives a majority in the Electoral College, each state’s delegation to the House of Representatives gets one vote to decide the election. In this situation, the Senate would choose the vice-president from the top two finishers. With Republicans in control of the lame duck Congress, the House would be unlikely to choose Hillary or Donald Trump if another option was available. To have a prayer of success, a third party conservative would need several attributes. First, with little time between the Republican convention in July and the general election in November, the candidate would have to be well known to the American public at the beginning of the campaign. There would be no time for the “get acquainted” period enjoyed by Ross Perot during his semi-successful third party run in the 90s or the long runup to the nomination that allowed relative unknowns like Marco Rubio, Ted Cruz, and Bernie Sanders to be catapulted to national status. Good and popular conservatives such as Mike Lee (R-Utah) and former Florida congressman Allen West would be probably not work because they are not well known outside the conservative movement. Second, the candidate would have to have the ability to unite the various anti-Trump factions of the Republican Party under his third party banner. With Trump winning 30-40 percent of the vote in Republican primaries, 60-70 percent of Republicans still oppose him, but they are fragmented into several factions. There is the establishment, the Tea Party, national security conservatives, economic conservatives, libertarians, and evangelicals to name a few. It must also be assumed that a number of anti-Trump Republicans will vote for him anyway simply because of the (R) after his name. Any candidate that represents only one faction, such as Ted Cruz or Jeb Bush, would be unlikely to unite the disparate factions of the GOP. Many states also have sore loser laws that prevent a candidate from running as an independent after losing a partisan primary. The effectiveness and constitutionality of these laws is questionable, but an opponent could conceivably use them to keep a previous candidate off the ballot in the general election. For this reason, any conservative who was a candidate in the Republican primaries would not be a likely third party challenger. We can say “adios” to Marco Rubio, Ben Carson, John Kasich and Carly Fiorina. The third party challenger would also need support from within the current Republican Party. Current Republican politicians would need to steer voters away from Donald Trump and toward the third party candidate. While some Republicans have endorsed Mr. Trump already, many Republicans will probably never get on board the Trump train. Because a candidate launching a campaign just a few months before the election would have little time for fundraising, personal wealth would also be a plus. Like Bloomberg and Trump, who have the wherewithal to spend large sums of their personal fortunes on a presidential campaign, a conservative third candidate would clearly benefit from being rich. If the candidate did not have his own money, he would need quick access to conservative donors such as Sheldon Adelson or the Koch brothers. There are precious few potential candidates who meet all or even most of these requirements. The most obvious potential candidate is Mitt Romney who came within a whisker of beating Barack Obama in 2012 and who looked even better to American voters in retrospect. In recent weeks, Romney has launched sharp criticism of Donald Trump over his refusal to release his tax returns and the Trump campaign’s connections to racist groups. Romney has also recorded anti-Trump robocalls for Ted Cruz. It is unclear at this point whether Romney is positioning himself to run as a conservative alternative to The Donald or whether he is just trying blunt Trump’s lead over this year’s candidates. Romney may also be thinking forward to a contested convention. If the three frontrunners emerge from the primary fight without a majority of delegates and too bruised to win the general election, Republican delegates might look to Romney to be the party’s “white knight” as a consensus nominee. Another interesting possibility is to send in the Marines. Specifically, there has been a recent groundswell of support for a movement to draft retired Marine General James Mattis. In the Daily Beast John Noonan compared Mattis to President Eisenhower and called him the “only hope” to “save us from Trump – and Clinton.” Noonan says that Mattis, a political outsider with a strong foreign policy and national security resume, would satisfy voter desires for “a strong leader, one who is upright, honest, and unstained by political blood sport.” On the downside, Mattis is not a household name. Last week, Mattis, nicknamed the “Warrior Monk,” was asked about the “draft Mattis” movement. The Daily Caller reported that he answered, “I think it’s merely idle chatter,” an answer that effectively ducked the question. A third possibility for a third candidate is Gary Johnson of the established perennial spoiler, the Libertarian Party. A recent Monmouth poll found the former Republican governor of New Mexico and 2012 Libertarian presidential candidate at 11 percent. While this is a distant third to Hillary and Trump who polled at 42 and 34 percent respectively, it is an order of magnitude higher than Johnson’s actual performance in 2012 when he won one percent of the vote and no electoral votes. Libertarian candidates are normally statistical blips. This year, the Libertarian Party has the advantage of having a developed network to get on the ballot in all 50 states. A firm rule of American politics is that third parties never win. Most often, they hurt the party that they are more closely aligned with and throw the election to their ideological opponents. What we have seen so far, however, is that 2016 is a year like no other. This year anything can happen… or so it seems.